REVIV is the city’s first IV infusion clinic, and in one corner of the oh so Zen space is a woman stretched on a white couch, casually flicking through a magazine while hooked up to a vitamin, mineral and antioxidant IV infusion drip taking about 30 minutes. REVIV was founded in the US by four doctors with experience in treating dehydration and restoring energy levels. 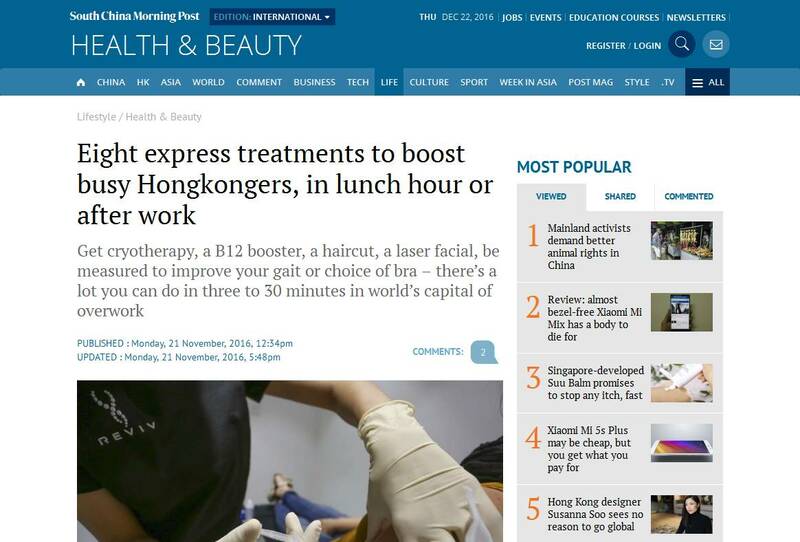 One of the fastest-growing global well-being trends and has gained a cult following since arriving in Hong Kong. Hydration is a core benefit of our therapies. Hong Kong is a work hard, play hard city, so our services help those people, whether they are busy executives or busy mums and dads. Vitamin B12 intramuscular injection is a water-soluble vitamin that plays a vital role in normal functioning of the brain and nervous system, and formation of red blood cells. REVIV Hong Kong, suite 2202, 1 Duddell Street, Central, tel: 2530 9882 – revivme.com/hong-kong.